Sandy Cape & Stock Yard Gully - 16 & 17 Jan 2016 - Myself, Craig & friends go camping and exploring. Dwellingup - 11-13 Dec 2015 - 6 Cars follow TC to Dwellingup for some relaxation & 4WDing. Jurien Bay - 27-29 Nov 2015 - 7 Cars from the club camp on the beach for some R&R. Boddington Rodeo - 7 & 8 Nov, 2015. Trip to Boddington for WA's largest Rodeo. Red Centre trip - 2 weeks, July 2015 - Juan and I explore the Red Centre or Australia. Aurora Ranges - 29 May - 4 days... 7 vehicles, great scenery, good company, excellent food, perfect weather. South West trip - 1 week, Feb 2015 - Juan and I head down south for 1 week of site seeing and cmaping. GoBush Xmas bash - 29th Nov 2014 - Annual Xmas bash at Eric's block. Seabird via Guilderton - 8 cars from the club do the sand track run to Seabird for a nice Cafe lunch. Canning Stock Route - 5 cars tackle the mighty CSR over 2 weeks. Ninghan Station WIldflowers - 28 Sep 2013 - 7 club members hot the outback for some R & R over 3 days. Pinjar 4WD - 3 Sep 2011 - 5 cars from the club hit the sand hills out the back of Pinjar Pine forrest. Ayers Rock Trip - July 2011 School Holidays - 5 cars head for the Red Center. Ellendale Pool trip - 19 Feb 2011 - A trip to explore this great site, but we got washed out with rain! Cervantes Trip - 7th-9th Jan 2011 - 7 cars explore Cervantes, Jurien, Wedge, Grey, and in between. Ninghan Station Trip - 1st - 3rd Oct 2010 - 3 cars go exploring in search of Wildflowers. Helena & Aurora ranges Trip - 4 - 7th Jun 2010 - 9 cars on a fantastic 4 day adventure. Goldfields - 24 Apr 2010 - 6 cars from the club head out north of Merriden to explore some historic sites. Helena and Aurora ranges - 12-14 June 2009 - 6 cars explore the ranges, camp on a mountain, and get muddy! Wilbinga - 18 Jan 2009 - 8 cars from the club hit the beach at Wilbinga. Pemberton - 29 Sep 2007 - 10 cars from the club, over 3 days, taking in the great scenery and overflowing dams! Ramp Test at Southern Spirit 4WD Centre - 6 Dec 2006 - Club members have their 4x4's ramp index calculated. Moore River Xmas Bash - 25 Nov 2006 - 12 cars from the club attend the xmas bash & work those CV's. Wilbinga - 29 Oct 2006 - A big group of cars from the club hit the beach at Wilbinga. Wilbinga - 5 Feb 2006 - 14 4WDs from the club spend the day wheeling and swimming. Walpole - 14 Jan 2006 - 3 trucks from the club go exploring in the South West. Harvey - 3 & 4 Dec 2005 - 4 trucks from the club go exploring and camping around Harvey. Lake Indoon - 30 & 31 July 2005 - 6 cars from the club go Water Skiing and camping. Kalbarri - 3 July 2005 - 3 cars (2 from the club) hit Kalbarri for 1 week. Mundaring - 19 June 2005 - 7 cars fromt he club tackle the Mundaring Powerline mud. Moore River (Inland) - 19 Sep 2004 - Day trip to explore the inland areas of Moore River! ART 2004 - Ayers Rock trip - Our biggest 2 week trip yet! Over 7500k travelled! Steep Point - 13 Jun 2004, overnight camping in Shark Bay after a business trip. Balingup - 24-26 Apr 2004, Anzac day Long w/end. The best hill climbs and scenery! Yellowdine - Easter 2004. 5 days in the outback, with lot's of mud driving! Wilbinga - 21 & 22 Feb 2004. Overnighter for some fishing and socialising. Lake Indoon - 16 Jan 2004. Day trip, including Wedge, Stock yard gully etc. Cape Arid - Christmas 2003. 8 days and 2500k exploring Israelite bay, cape Arid and more. Collie - 13-14 Dec 2003. Weekend of great camping and 4WDing near Wellington Dam. Grey (via Wedge Island) - 25-26 Oct 2003. Weekend at Big Pete's Shack. Night Owl 2003 - 4WD gymkhana - 27-28 Sep 2003. Perth's premier off-road event. Outback Adventure - 13-15 Sep 2003. Rushy's 3 day trip exploring Ninghan station and beyond. Collie - 2-4 Aug 2003. Tackling the awesome muddy hill climbs of Collie in winter. Mt Augustus & Karijini - 6 to 16th Jul 2003 - A 11 day outback trip to visit the largest rock in the world! Pemberton - 31 May 2003 - A 3 day trip to our fantastic south west coastline, including Calcup hill. Collie - 25 Jan 2003 - Camping at Collie on a long weekend, and exploring surrounding forests. Balingup - 30 Nov 2002 - A 2 day camping trip to Balingup for some awesome hill climbs & scenery! Lady's Day (Toodyay) - 17 Nov 2002 - The Lady's take the wheel for some off-road action! Holland Track - Nov 2002 - 4 days and 7 vehicles do the historic Holland track outback trek. Millstream - Up north on 20 & 21st Oct 2002 - Skip and Styx relax at Millstream after a work trip to Karratha! TC's Harvey Explorer - Day trip - 5th Oct. Exploring the tropical forests in the rain! Dunsborough Trip (long weekend) - 28th-30th Sep - Including Wineries, Black point, Lake Jasper, 3 Bears! McGyver's Mystery Trip - Sep 8th - Macca's mystery trip through Muchea bush, and Flat-rock beach. 76 pics! Moore River day trip - Aug 11th - Day trip to tackle the river crossings of Moore River. Darwin Trip - July 2002 - 3 week trip to the Northern Territory. 280 pics! Mundaring Hill Climbs - 16 June 2002 - 1 day trip to test our vehicles out on the Awesome hills! Moore River Mud - 9 June 2002 - 1 day trip to the Moore River state forest. Mud Bath! Wedge Island - 1 June 2002 - 3 day trip to Wedge & Cervantes! Night Nav - 18 May 2002 - The 4WD club's famous night nav event - organised by me! Dwellingup - 2 May 2002 - Day trip to test my Hilux with it's new Canopy and Bullbar etc. Balingup - 13&14 April 2002 - 2 days of camping & 4WDing, in picturesque Balingup / Nannup. Pemberton - Easter 2002 - 3 days of camping & 4WDing, including Calcup, and Warren River. Wedge & Stock Yard Gully - 16th Mar 2002 - 2 days of camping, 4WDing and caving. Balingup - 26th Jan 2002 - 3 days with the Nissan club, camping at Wright's bridge. Awesome! Pemberton Xmas 2001 - Xmas to New Year - 5 days exploring the Warren River & D’Encastreux national parks. Xmas Hangi at Moore River - 24th Nov 2001 - The 4WD club's Xmas bash, with a traditional Hangi feast! Dwellingup - 4th Nov 2001 - 7 vehicles tackle Nanga Hill & other awesome hill climbs! 4WD club meeting & Muchea Mud - 26 Oct 2001. Meeting in the bush, then a play in the mud. Alchimos sand dunes - 20th Oct 2001 - 7 vehicles play in sand at the Alchimos! Ayers Rock Trip (ART) - Oct 2001 - 5 vehicles hit the red centre for 2 weeks! Over 850 photos! Mt Observation - 16 Sep 2001 - 4 vehicles tackle the mud! Canning Stock Route - July 2001 (3 weeks) My most remote trip yet, the mighty CSR. 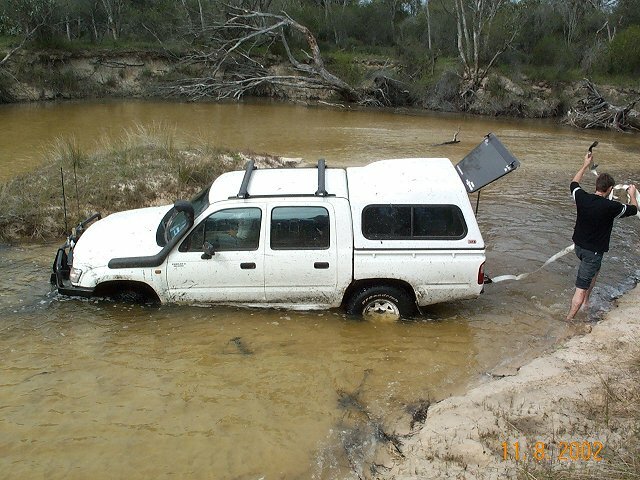 Moore River mud - 23 June 2001 - 11 vehicles tackle water and mud driving, through picturesque bush. Many recoveries! Jurien Bay 17 & 18 Mar 2001 - 7 vehicles go for an overnighter at Jurien bay, also visiting stock-yard-gully caves. Dwellingup 4&5th Mar 2001 - Cam & skip go camping & 4wding along the Murray river. Bremer Bay 2000 - 1 week over Xmas & New year, eating, partying, & 4WDing WA's awesome southern coastline! Mundaring hill climbs - 3 Dec 2000 - Another quick run through the hill climb circuit, Cam's 1st time. McGyver plays on a hill Nov 2000 - Cam and McGyver test their approach & depart angles. Alchimos on 18th Nov 2000 - A quick run to have a play in the dunes and a swim as well! 28 pics. Overnighter at Base Camp - 5 Nov 2000. A quick 1 nighter in Pinjar Pines. Digger's Mystery Trip - 15 Oct 2000. Total of 16 4WDs in convoy through Harvey forest & hill climbs. Night Navigation 3 - 23 Sep 2000. Over 40 4WDs test their night nav skills in Skip & Cams event. 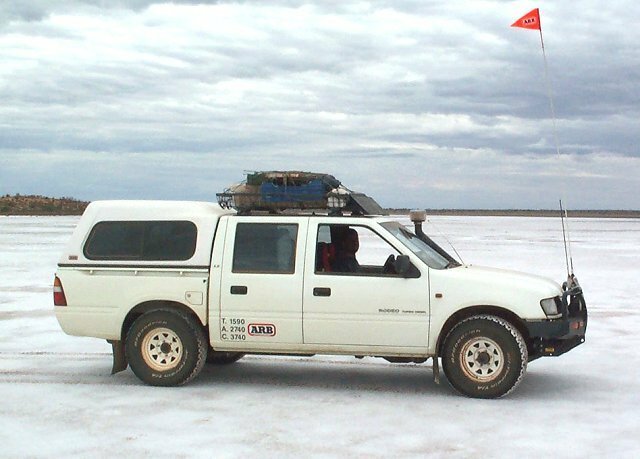 Kimberley's trip - 3 cars, 3 weeks, 8100k's! Our biggest & best trip to date. August 2000. 220 pics! Mundaring - Quick run through the hill climbs after rain! Bremer Bay - December 1999 - Awesome camping holiday in WA's south west between Christmas and new year. Dwellingup / Nanga Hill 1999 - 3 club members tackle the mighty Nanga hill and surrounding hills! Send me some feedback about these pages, by emailing me.